Flyers general manger Chuck Fletcher. ST. LOUIS – The Flyers’ search for a coach will not drag out into the summer, and it will be completed before the NHL draft starts on June 21. 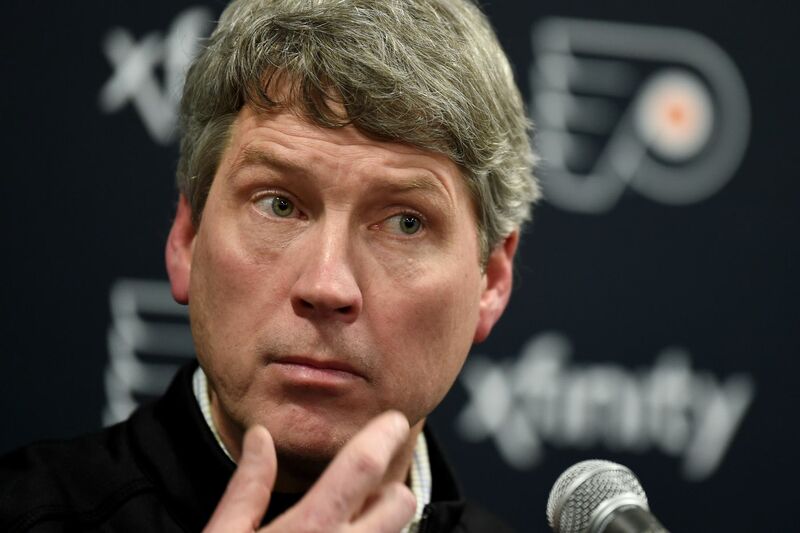 “It will certainly be done well before the draft, but there’s no time frame,” general manager Chuck Fletcher said after the Flyers’ morning skate Thursday at the Enterprise Center. The Flyers, in their final road game of the season, face the Blues Thursday at 8 p.m.
Fletcher praised the job Gordon has done. Joel Quenneville, who led Chicago to three Stanley Cups, is believed to be high on the Flyers’ wish list. It is also worth noting that Fletcher was a Penguins assistant GM and the man who hired Dan Bylsma to coach Wilkes-Barre/Scranton, Pittsburgh’s AHL farm team, in 2008. Bylsma later coached the Penguins to the Stanley Cup in 2009. Mike Yeo, a Pittsburgh assistant that season, also has connections with Fletcher. When Fletcher was the Minnesota GM, he hired Yeo as his head coach and fired him five years later. Yeo was dismissed by the Blues earlier this season and is a dark-horse Flyers candidate. As for this season, Fletcher, who replaced the fired Ron Hextall on Dec. 3, called it disappointing to miss the playoffs and said the year was too inconsistent. The Flyers will have lots of cap space and they are expected to be active in the trade and free-agent markets. The Flyers are 18-18-4 on the road, 19-17-4 at home. ... Fletcher will be at the draft lottery at 5 p.m. Tuesday in Toronto The Flyers have the 11th pick as it now stands, and they currently have a 3.0 percent chance to get the No. 1 pick, a 3.3 percent chance to get the No. 2 pick, and a 3.6 percent chance to get the No. 3 pick. The draft will be held June 21 and 22 in Vancouver. ... The Flyers’ prospect camp, which will include their new No. 1 draft pick and is open to the public, will tentatively start June 24 in Voorhees. It will culminate with a scrimmage on June 29.